Fast-approaching a decade in music, Leeds' spiky indie kids-turned-men continue to solidify their reputation as a live band by announcing another lengthy UK tour for 2013. Their last travels involved plugging their 2011 album, "Up, Guards and at Em!" and saw the band covering much of the UK with headliners and festival appearances including Scotland's RockNess. A far cry from being third on the bill at a Kaiser Chiefs concert and playing in the basement of a Virgin Megastores in 2006 (believe me, they were fantastic). For 2013, album number four looms ever nearer and is set to follow in the footsteps of that last studio set and its predecessors "Wait for Me" and "Emergency". 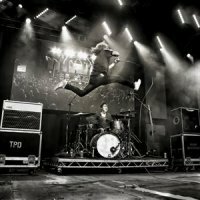 To further entice fans back to the band, The Pigeon Detectives will be issuing a single called "Animal" which you can download for zilch from www.thepigeondetectives.com . The album itself will follow later in the spring, as will a full-length UK tour. The first stop is Preston on 25th April, followed by Whitehaven, Sheffield, Stoke and lots more until Cambridge on 6th May. In amongst those dates are shows in Camden (at Dingwalls so not a huge venue) and a slot at the Live at Leeds 2013 festival (The Vaccines and Rudimental also confirmed). Tickets on sale now, with prices from £12.50 upwards.